Journal Entry:”Sailing from San Francisco to Hawaii, our ship hit a deadly storm and crashed on a mysterious island. Survival was our first instinct, however we soon discovered we were on a tropical paradise!”Welcome to Tropic Trouble, a brand new match 3 experience. Blast through challenging obstacles, complete fun puzzles, collect precious resources and build your own island wonderland.Use your resourceful nature and become the family hero, as you match, pop and crush through this dashing free game. Earn coins to build your tropical escape as you explore the story of this mysterious island, while fending off the troublesome gorilla! Snap, post and share your beautiful decorations and become the envy of your Facebook best friends. Complete side quests to earn boosters and gems! Dive to a nearby pirate shipwreck, dig for treasure, climb aboard a ghost ship and more.- Match, earn, build, repeat: addictive free game you can play offline!- Exciting and unique game modes with fun animations- Dig into this richly detailed world with tons of hidden booty- NEW amazing and challenging achievents that generously reward your skills- Explode dazzling bombs and blitz through levels as you collect coins to decorate your island- Share and compete for the best decorated tropical paradise among your Facebook friendsYour next vacation awaits in this new match 3 experience. 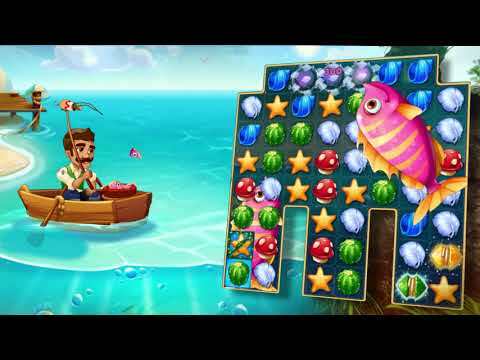 Play Tropic Trouble Today!